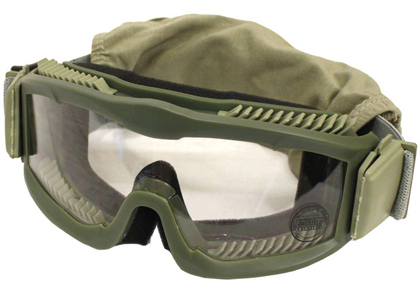 From Budget to Baller: A Complete Guide to Airsoft Goggles, Masks, Etc. We get asked a lot about our reviews of the best airsoft goggles to wear over glasses–why we didn’t include certain models, reader opinions, comments, and more. It has become a touchy subject, and arguably our most “controversial” write up. With every face/player being different, it makes sense that everyone has different experiences with different airsoft goggles and their effectiveness, but one thing is certain– everyone hates fog. Aside from safety, fog is the number one reason someone tosses a pair of goggles in the trash. If you can’t see the field, your enemy, or your teammates, whats the point? There has also been some confusion on what constitutes “full-seal”, whether mesh facemasks are optimal for safety, and how to keep your goggles fog-free as long as possible. Buckle up, because we’re about to tag you with some airsoft goggle knowledge. To start, we’ll quickly cover the two options for protecting your face from speeding BBs– full face masks and airsoft goggles (which are recommended to pair with a lower-half face shield). Why? While you may think your eyes are all that need to be covered, an airsoft BB can easily chip a tooth or cause a fat lip, so if you’re going the goggle route, a face shield is a must. However, there are pros and cons to each of these choices, and many official airsoft matches require that you have what’s called “full-seal” protective eyewear, so we’ll cover what that means exactly. Full airsoft face masks simply offer the most protection, and are commonplace in matches worldwide. 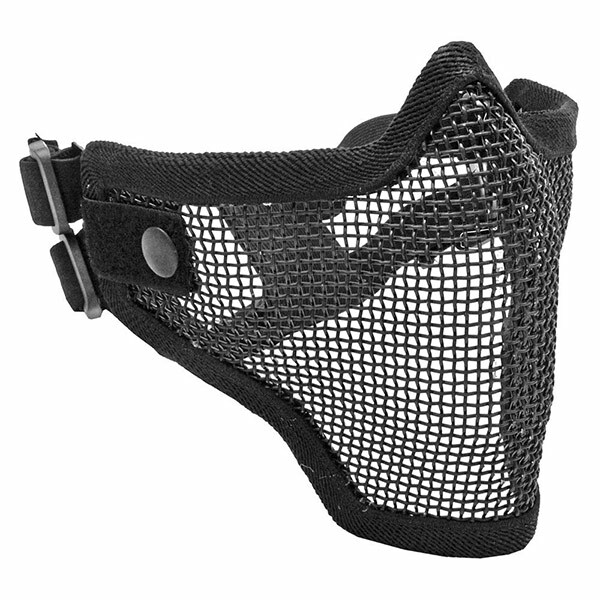 They generally fit pretty snug against the face, and can extend all the way up the forehead, providing the most coverage of all the airsoft face protection options on this page. However, that comes at a cost. Because it sits so close to your face and covers so much area, the chance of fogging is high. 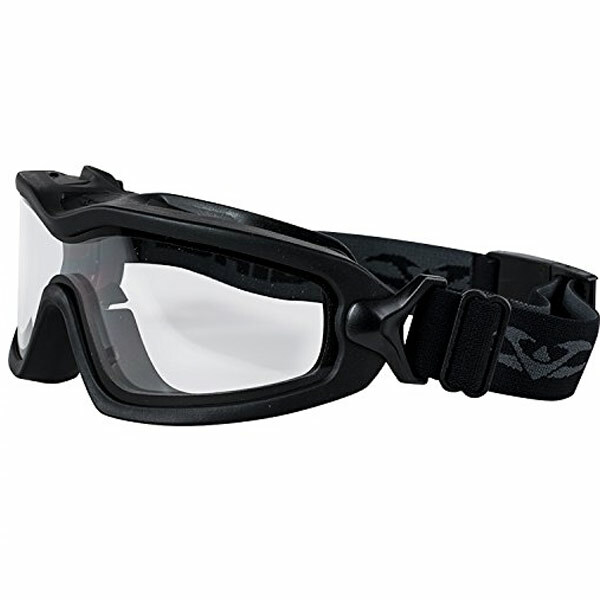 As we make our way through this list, the order of importance (as we see it) for airsoft goggles and masks is the following: Safety, Visibility, Comfort, Style. In that order. 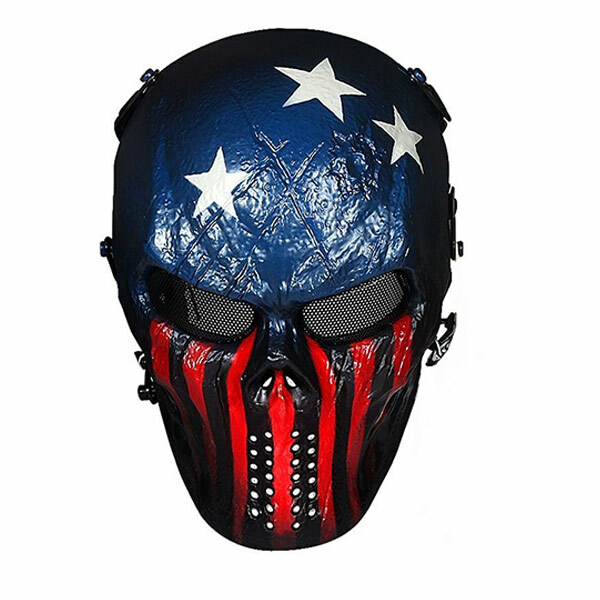 As far as full airsoft-specific facemasks go, this one is hard to beat. 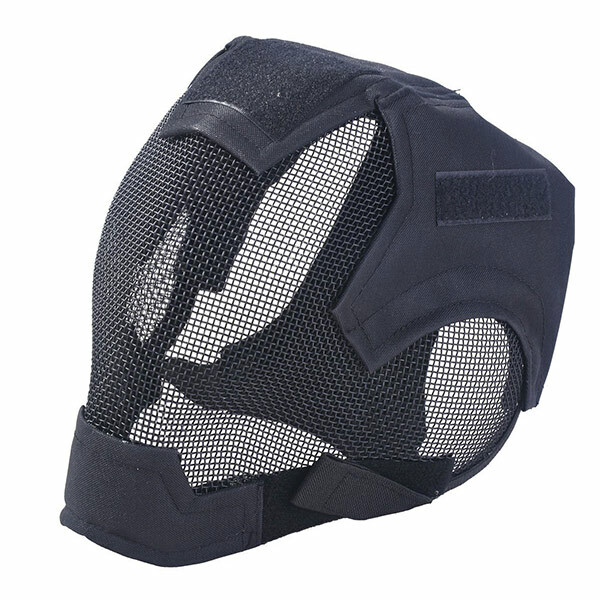 It’s comfortable, adjustable, and provides significant protection. 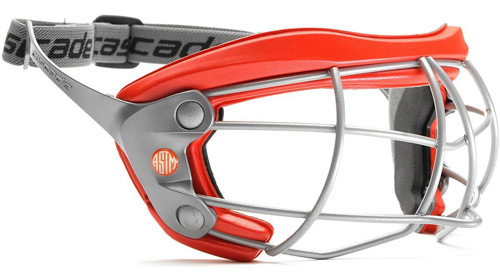 The eye holes are metal mesh, not lenses, so you may want to choose a lensed mask if you’re playing in very close quarters. There aren’t a ton of ventilation holes, but because you can’t fog anything up, that doesn’t matter a whole lot in this case (unless you get very sweaty). Same mask as above, but without the paint job, which may turn some people off. Alternatively, depending on the scenery in which you play, you may be interested in painting the mask yourself with a digi-camo or foliage effect. Customization is everything! 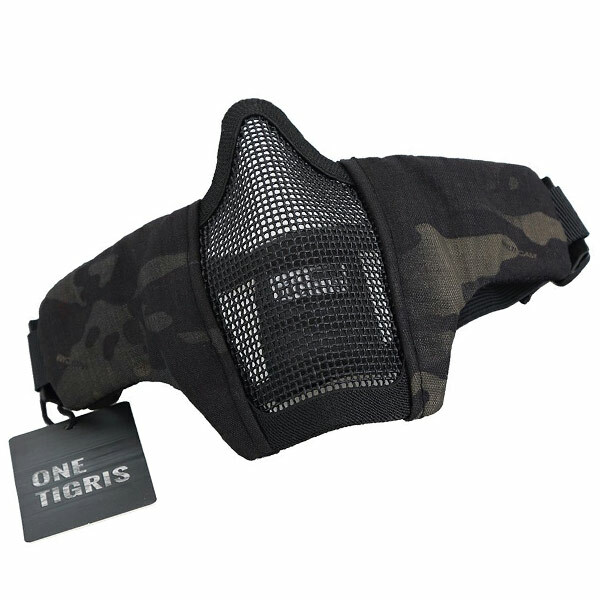 This full mesh head cover is very very tough, and provides an all-over, comfortable fit. Unlike the facemasks above, this is entirely ventilation, which is great for very warm climates. It may be difficult to focus on long range targets with the mesh in front of your face, and if you use an optic on your rifle, getting a proper cheek weld may be difficult. 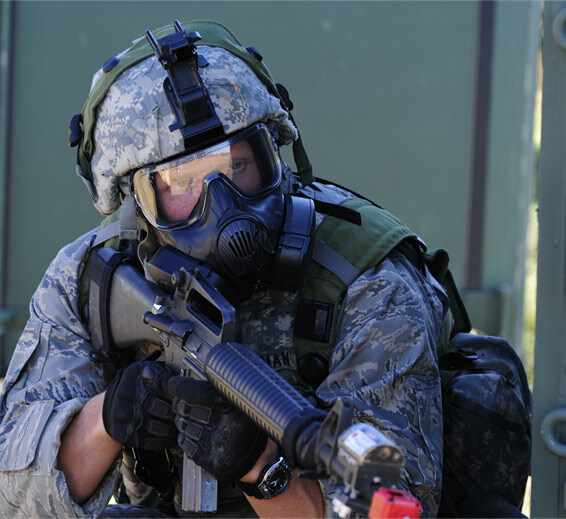 Can you use a paintball mask for airsoft? We certainly think so. You may read some accounts saying that paintball masks aren’t an appropriate option as an airsoft face mask as they occasionally have holes that are larger than the diameter of the plastic BBs. This is true, but you simply need to keep this in mind and choose a paintball mask that is appropriate. 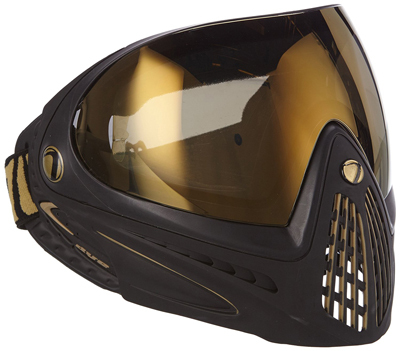 Paintball masks are well-designed to fit comfortably, fight fog, and many fit over prescription eyeglasses well. 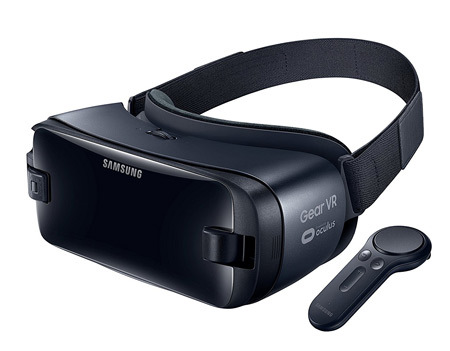 These are the priciest option, but they are the top choice in our opinion, as they check all the boxes of protection, vision, comfort and style. Bonus: if you also play paintball, then you just have just one piece of gear to buy. 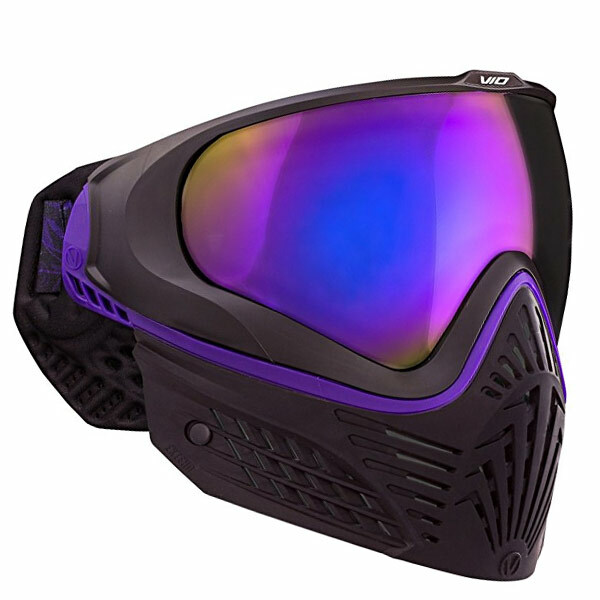 While it’s marketed as a paintball mask, the Dye I4 is well-suited for airsoft. It also fits well over glasses, if you wear them. (More on that here). The minimal design lets you get closer to your optic and get a proper cheek weld. Extremely fog-resistant. Another favorite for players is the VIO Extend, which is top tier quality and protection. (these, however, will not comfortably fit over eyeglasses, for what it’s worth). 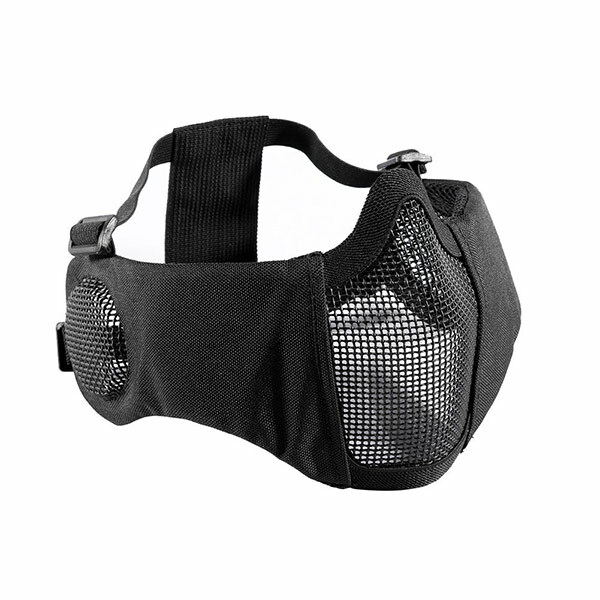 What we like is that the bottom half can be removed, which is handy for outdoor games that you’d prefer a little more ventilation by using a lower-half mesh mask (see down the page). Maybe you prefer to wear a tactical helmet or shemagh, or just prefer the lightweight nature of protective airsoft goggles. In that case, there are a handful of options for quality goggles to wear that can stand up to repeated BB impact. As for goggles, it’s hard to beat the Lancer Tacticals. 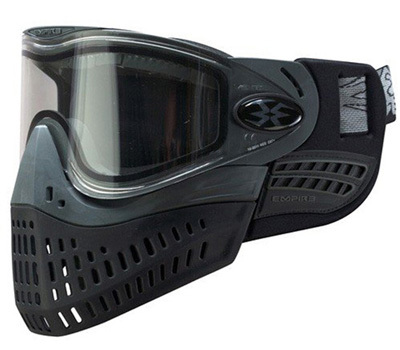 They are specifically designed for airsoft, with slanted vents to keep BB’s out and prevent the goggles from fogging up, at which they are quite effective. This are a bit on the large size, so if you’re a smaller teenage player, consider the Valkens below. These provide the least amount of coverage area, so a lower half mask is highly suggested, but they are almost impervious to BB impact and really fight fog well. Good for small and large faces alike. 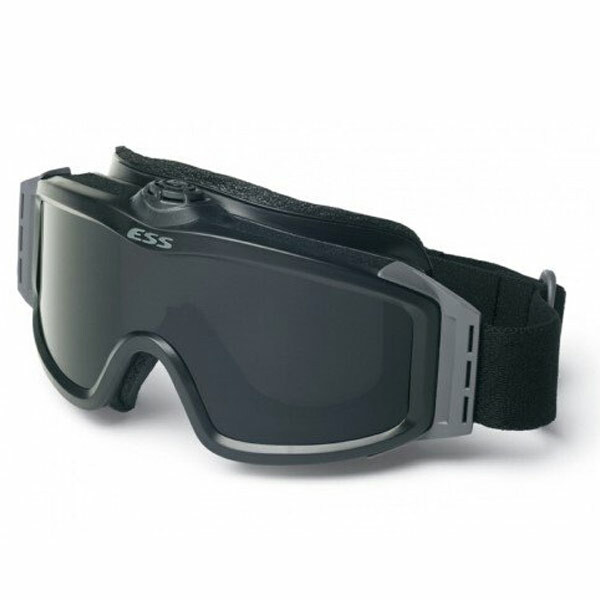 The Rolls-Royce of goggles, these ESS’s are what some military branches use in the field. They’re tough, comfortable, and feature a small fan to keep airflow moving within the interior. The fan can get slightly noisy, but only to yourself (not other players). Note: another benefit to airsoft goggles (as opposed to a full mask) is that you can get a proper cheek weld to your airsoft rifle – meaning, you can place your face close to the sight. So if you’re more of a sniper that uses either a scope or a holographic sight, airsoft goggles will be a better choice. Will any safety goggles work? 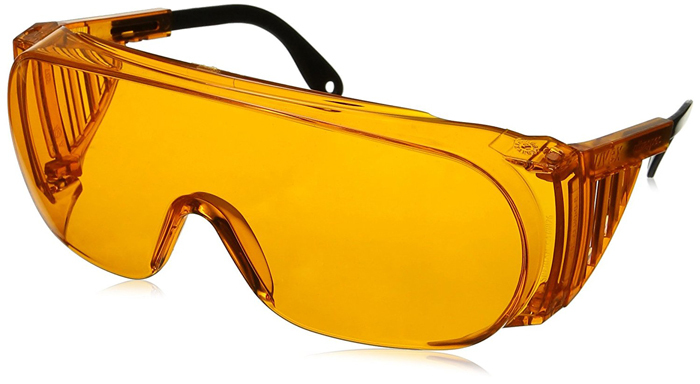 Early/beginner players might think that simple safety glasses might be enough to play a casual game of airsoft. While it’s certainly better than having NO goggles, these are not designed for this unique sport. Often times, safety goggles and worse, safety glasses, still have wide gaps that BBs can ricochet into. The goggle options above are full-seal (no gaps) and aren’t wildly expensive, so it’s worth the investment to protect your eyes and face. 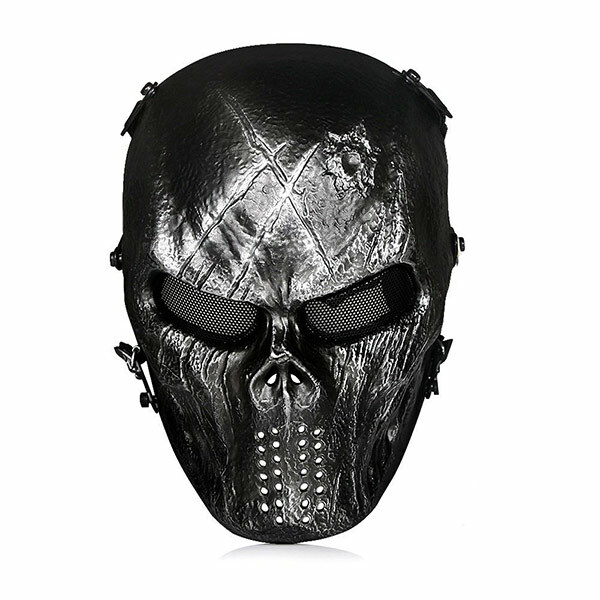 This half mask is a little more secure on the head, perfect for games when youre running through brush or constantly putting your cheek on the weld of your rifle stock. Maybe a little less ventilation than the mask above, but definitely a higher quality product. Pretty similar to the OneTigris model above, but with cutout mesh holes over your ears, making it easier to hear your teammates instructions and approaching enemies. 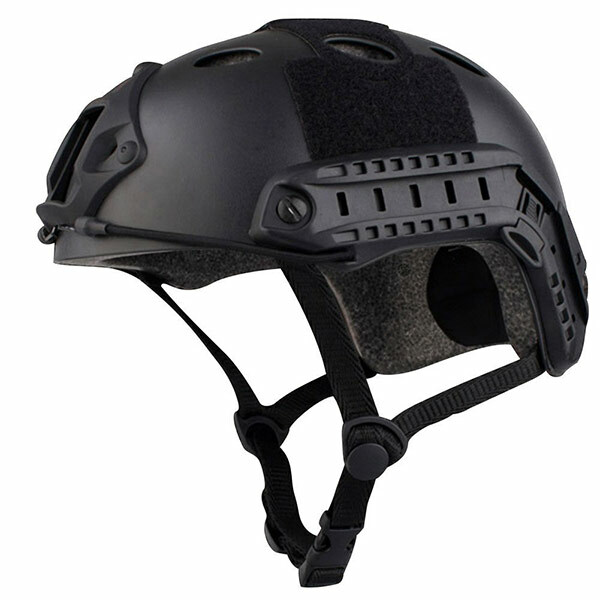 Go for the full tactical look with this lightweight ABS tactical helmet that fits heads up to 7 5/8″. The inner suspension is comfortable and lets the top of the head breathe to cut down on overheating. Let’s say you’ve made your choice and spent some cash on an awesome, comfortable set of airsoft goggles – and your first day on the field, they start fogging up. F**! What can you do? 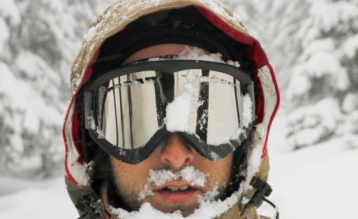 First, there are some general goggle fogging prevention tips (whether its airsoft, snowboarding, etc.) that you should keep in mind. In the instance of airsoft, make sure that whatever is in front of your mouth is breathable and not shooting hot air straight up into your lenses. 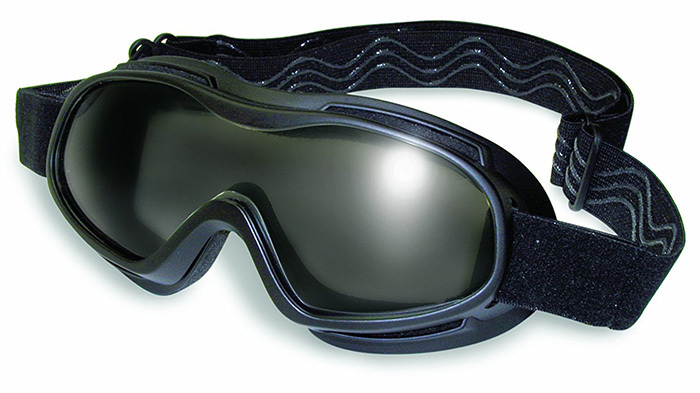 You can also pick up a cheap anti-fog solution to treat your goggles before you begin. The science behind these has come a long way from just rubbing spit around the inside, and they only cost a couple bucks for hundreds of treatments. Whether you choose a full face mask, paintball mask, or separate airsoft googles with a lower half mask, you should now be prepared and well-informed to keep your eyes and face safe as you flank the other team!